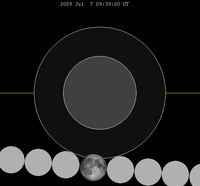 An eclipse season is one of only two periods during each year when eclipses can occur, due to the variation in the orbital inclination of the Moon. Each season lasts about 35 days and repeats just short of six months later, thus two full eclipse seasons always occur each year. Either two or three eclipses happen each eclipse season. During the eclipse season, the inclination of the Moon's orbit is low, hence the Sun, Moon, and Earth become aligned straight enough (in syzygy) for an eclipse to occur. The type of each solar eclipse (whether total or annular, as seen from the sublunar point) depends on the apparent sizes of the Sun and Moon, which are functions of the distances of Earth from the Sun and of the Moon from Earth, respectively, as seen from Earth's surface. These distances vary because both the Earth and the Moon have elliptic orbits. If the Earth had a perfectly circular orbit centered around the Sun, and the Moon's orbit was also perfectly circular and centered around the Earth, and both orbits were coplanar (on the same plane) with each other, then two eclipses would happen every lunar month (29.53 days). A lunar eclipse would occur at every full moon, a solar eclipse every new moon, and all solar eclipses would be the same type. An eclipse season is the only time when the Sun (from the perspective of the Earth) is close enough to one of the Moon's nodes to allow an eclipse to occur. During the season, whenever there is a full moon a lunar eclipse will occur and whenever there is a new moon a solar eclipse will occur. If the Sun is close enough to a node, then a total eclipse will occur. Each season lasts from 31 to 37 days, and seasons recur about every 6 months. At least two (one solar and one lunar, in any order), and at most three eclipses (solar, lunar, then solar again, or vice versa), will occur during every eclipse season. This is because it is about 15 days (a fortnight) between full moon and new moon and vice versa. If there is an eclipse at the very beginning of the season, then there is enough time (30 days) for two more eclipses. In other words, because the eclipse season (34 days long on average) is longer than the synodic month (one lunation, or the time for the Moon to return to a particular phase and about 29.5 days), the Moon will be new or full at least two, and up to three, times during the season. Eclipse seasons occur slightly shy of six months apart (successively occurring every 173.31 days - half of an eclipse year), the time it takes the Sun to travel from one node to the next along the ecliptic. If the last eclipse of an eclipse season occurs at the very beginning of a calendar year, it is possible for a total of seven eclipses to occur since there is still time before the end of the calendar year for two full eclipse seasons, each having up to three eclipses. In each sequence below, each eclipse is separated by a fortnight. 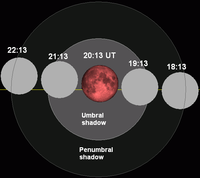 The first and last eclipse in each sequence is separated by one synodic month. See also Eclipse cycles. The partial lunar eclipse of August 7-8, 2017 was followed by the solar eclipse of August 21, 2017. ^ Littmann, Mark; Fred Espenak; Ken Willcox (2008). Totality: Eclipses of the Sun. Oxford University Press. pp. 18–19. ISBN 0-19-953209-5.